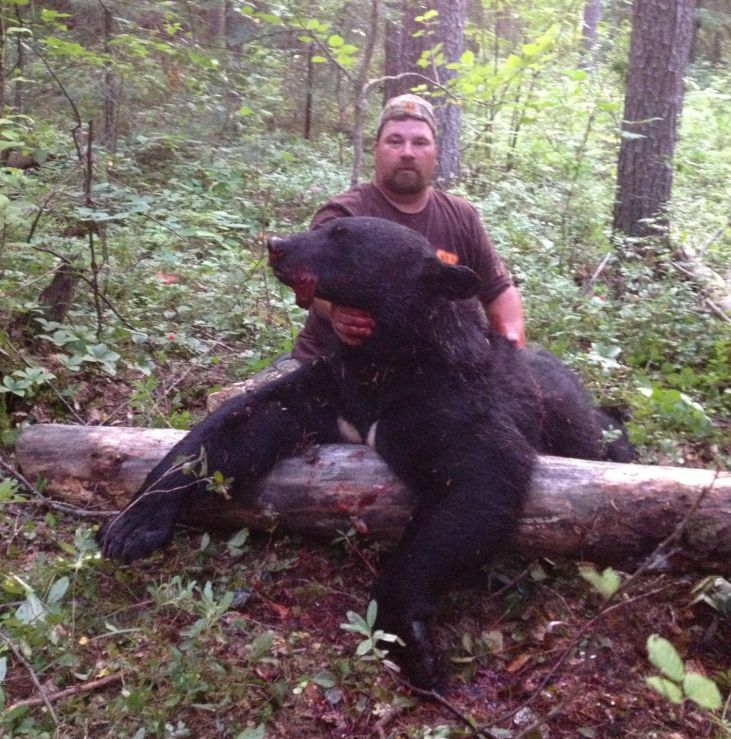 Professionally Organized Northern Ontario Black Bear Hunting! Keri Sr. & Keri Jr.
Golden Eagle Camp has an excellent reputation for our high success rates with the Fall Black Bear Hunt. We cater to both archery hunters and rifle hunters, offering packages including comfortable accommodations and experienced guide service. 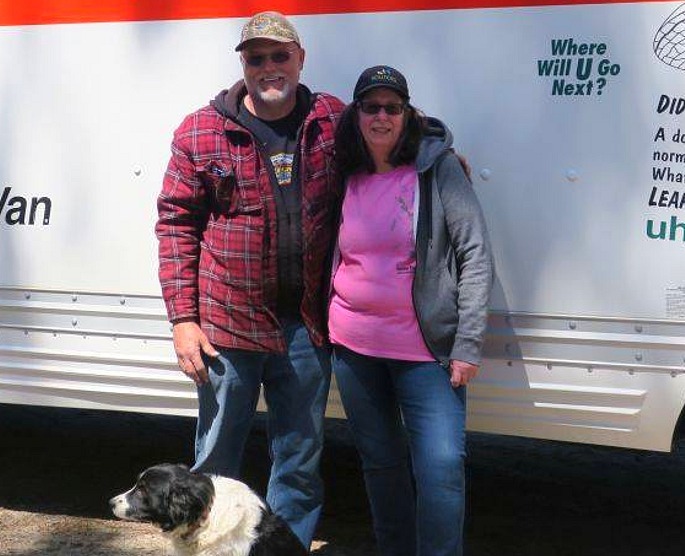 We do all the work… you have an exciting hunt and a relaxing vacation! Our large Bear Management Area is situated in prime upland game terrain, with almost 100 bear baits in over 300 square miles of Crown Land. All our bait areas are permanent structures built of wood, and have been in place for many years. Hunters will need to have vehicles or ATVs to get to and from their stands. We will be traveling mostly on logging roads, some of which are rough and brushy. When you arrive at Golden Eagle Camp, you will be directed to your fully equipped cottage. All cottages are fully furnished, have full kitchens and bathrooms, with bed linens provided. Prior to the hunt, we will have an information and licensing meeting. You will meet your guides, discuss a schedule, and be assigned your stand. To be issued your license, non-residents will need to have proof of prior hunting experience. In the Spring, our guides begin preparing for the hunt. Trails are cleared and all stands are checked, wrapped for better concealment, and repaired as necessary. Light baiting begins 6 weeks prior to the first day of the hunt, in order to “wake up” the bait areas. Heavy daily baiting begins 2 weeks prior to opening. Our baits consist of butcher shop meat scraps, beaver, popcorn, and molasses. The baits are placed in big metal drums at each tree stand, and meat scraps are hung above. Every hunter is guaranteed to be assigned to an active fresh stand. Game cameras are consistently rotated, so we have a very good idea of the size of bears and feeding times at your particular stand. Should the area become inactive, a new bait area will be assigned. Schedules can be adjusted to suit each stand’s unique requirements. We remain flexible to ensure the best possible success, and take each hunter’s individual preferences into account. 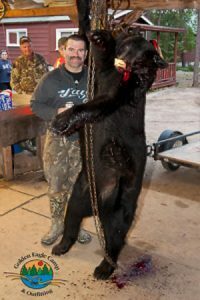 When you shoot your Black Bear, our guides will retrieve, gut, skin, and quarter your trophy – after pictures, of course! All processing is done on a sanitary stainless steel table, and the hide and meat will be stored in our walk-in freezer. After the celebrations, you can spend the rest of your vacation fishing, since a boat is included in your hunting package. 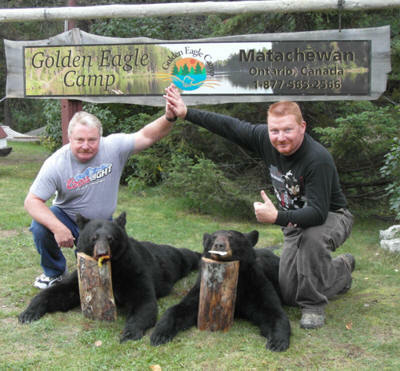 In order to best manage the bear population, and ensure personal attention to all hunters, we limit the number of reservations each year. Plan your trip soon to reserve your spot! 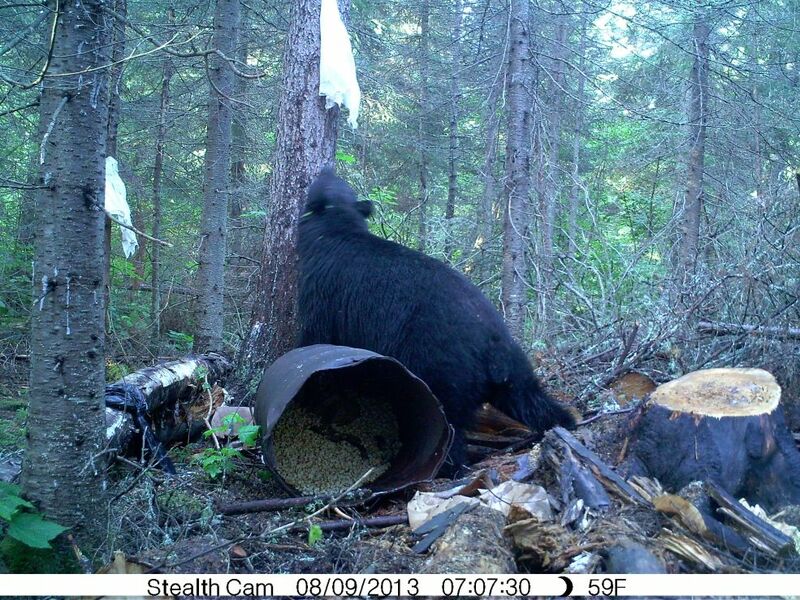 Golden Eagle Camp Record Black Bear! 598 lb boar shot by Jerry Davenport on August 18, 2013.